The Dog Days of August are upon us! In July we shared with you our tips on Cooling Rabbits. But we recently added illustrations to make it even easier for you to implement the ideas we offer. Feel free to go take another look! Almost since Raising-Rabbits came online, we’ve had folks contacting us with various particular questions. 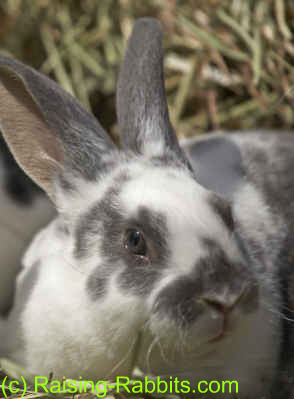 We’ve put all kinds of rabbit information on Raising-Rabbits -- to date you can find more than 100 pages of rabbit info. But sometimes you still find yourself in a particular situation and would like some specific help. So, we added a couple pages answering your Frequently Asked Questions: Info on rabbits answers many interesting questions about rabbits. Info on rabbits and Bunnies addresses your questions about pregnant rabbits, kindling kits and weaning bunnies. We know particular questions will still arise, and we hope you’ll continue to feel free to ask them! Contact us here. An informal survey of pedestrians in downtown New York City was recently conducted by DRDVM, a member of the Yahoo Meatrabbits group. "Where do you get your food?" The answer, in roughly 65% of persons, was simply, "From the store." "What do you think about growing and eating your own homegrown rabbits, goats and chickens?" This question was met with horror in 90% of respondents. "You’re crazy!" or, "That’s animal cruelty!" "Where does the store get the food?" -- No idea. Have you ever thought about where your food comes from? There was a time in early Americana, when anyone who cared to survive had to go find his supper with a musket, bowie knife, or a snare in the woods. Kids aged 6 were already helping their dads set the snares, and carrying the smaller catches back to the homestead. The concept of a ‘supermarket’ was not only unthinkable, but 200+ years in the future. Today, supermarkets ALWAYS have food in them. But will this always be true? In May of 2010, a water main in Boston broke, resulting in a tidal wave flowing down streets. The water was turned off in a chunk of the neighborhood for the duration of the repairs. For the few days that water was scarce, pandemonium broke out in the aisles of markets for miles around, as shelves emptied and normal people came to blows over bottled water. The National Inflation Association (NIA) caught the brouhaha on DVD, and we posted a copy on our Survival Preparedness page. And many Americans are indeed stopping to consider where they're getting their food. The survival drive of their forebears has begun to bubble to the surface. They're scrutinizing their food sources to ensure their food is not riddled with pesticides, hormones or antibiotics. More Americans are taking to raising chickens and rabbits, even in urban settings. See our Rabbit Farming page for one example. Rabbits in particular are easy to keep and they multiply like ... rabbits. One 10-pound doe can produce up to 200 pounds of nutritious, low fat meat per year. If you have, say, 4-5 does and a buck, you’re talking upwards of 1000 pounds of dressed rabbit meat per year, more than a single market steer (approximately 700 lb). All of this is easily accomplished in your backyard. Whether you have pet rabbits or whether you raise rabbits for food, we at Raising-Rabbits.com are thrilled to bring you extensive, illustrated information about every facet of raising rabbits, to make your project (or pet rabbit care) that much easier. And now we're bringing you rabbit supplies as well! Raising-Rabbits.com has teamed with Amazon.com. We now have several Amazon-based stores targeted to specific needs of pet rabbit owners, kids who like rabbits, and rabbit breeders alike. At the following Raising-Rabbit stores, you'll find a wide selection of rabbit supplies, books, pet rabbit supplies, kids’ books and DVDs about rabbits (think Bugs Bunny and Peter Rabbit), and survival rations and information. This should greatly simplify your search for the items you or your rabbits need, because we’ve found the best and put it all on one website. Our Rabbit Supplies Stores come with Amazon.com's full A-Z guarantee, so you can buy with confidence. It won't cost you a penny more than you would spend at Amazon.com. Many people groups depend on animals or animal product such as wool and milk for their survival. Have a great, not-too-hot, August!